Discussion in 'Thumpers' started by Chad05gsa, Sep 3, 2014. Came across this article today. It should be interesting to see how it does in the US marketplace? 385lbs with 18.5 HP, as much as I would like a lot more options in dual sport bikes, I dont know if this one is the answer. Specs do look pretty good though...anyone know what the price will be? The rest of their lineup is roughly $3k-5k...guess i'd have to ride one before i can say if it's a keeper. it says right in that blog posted above, $2895 first shipment, $3495 after that. Have you contacted Cycle World to have them give it a test ride when you get them. I can put you in contact with Mark Hoyer if need be. We have not contacted any of the mags yet...this is the first time we've posted a price. If you would like to let Mr. Hoyer know, we'd sure appreciate it. I see you have a couple of examples that you have been riding. What's the comfortable highway cruise speed? Will it do 75mph? Are these built to your specifications? or something the Chinese came up with? I read the first article attached to the first post...I also looked around the site and found the price list for the other bikes, which did not include the RX-3. The blog link was posted posted after my post, I did read it. The bike looks interesting but their wording on the website sounds just like an olde tyme circus promoter. I'm seeing almost 25 horsepower. About the same HP and weight of my Honda CBR250R. Looks like you get a lot of bike for the money. As in about 30 pounds more bike than my 640. Probably OK for the mission. I am sure it gets the job done. But DR650 weight seems like a lot for a 250 haul around. The weight is a bit disconcerting, but the rest of the specs and the price look quite promising. Looks like it would be a comfortable bike, wouldn't mind one for my daughter. I'd want to know more about the company, how long in the US, how many dealers, parts availability, intentional parts availability, etc. But as an adventure bike, I would think a 250 would be targeting the smaller statured and newer riders, and 385lbs is a lot for a small person or new rider to muscle about off road. Still, I wish them the best of success...good looking bike. So how about that 500cc ATV motor in this bike as another model? Zongshen has that motor in house and you've said they can make bikes most any way the customer wants. 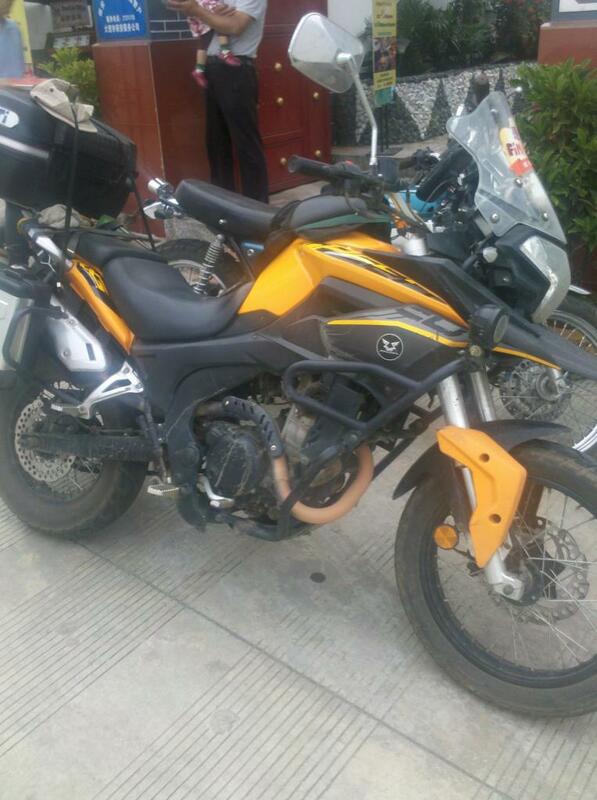 Came across a guy riding one of these in Dali Yunnan. He bought it new and had been on the road for 42 days through China, Laos, Thailand and Cambodia . 12000km with no problem. They sell for 20,000kuai in China so the price you guys are talking about seems good. While you are discussing the weight of the thing bear in mind all the plastic luggage and racks and crash bars are included standard in the price so they are probably included in the tare weight as well. It seems to me that the thing is weighed down with accessories and under it all is a pretty decent bike . The guy rode with us for a day and the bike was pretty quick . I have no interest in this company I would just like to see the thing get a fair go. Really have no idea who or what is their target market , but for Asian roads where you cant really ride fast because of the traffic/cows/yaks/landslides/unpredictability of the roads it seems a pretty fair choice. My two cents worth. LM15 and Jay_In_Milpitas like this.